Please see individual varieties for specific product information, but in general the growing information will be the same for all melons including watermelons and cantaloupes. The majority of the information on this page was provided by the University of Arkansas Cooperative Extension Service Watermelon Home Gardening Series; download the complete pdf file with FAQ’s for more information or click here to visit the website. 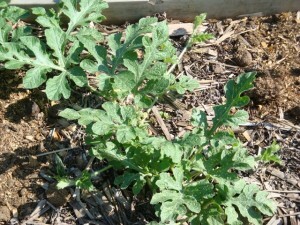 When To Plant: Watermelons should be planted after all danger of frost has passed when the weather is warm. Watermelons can be grown from seed or from young transplants. The earliest Charley recommends that you plant your watermelons is late April. Planting Tip: Watermelons, like Cantaloupes, do well when mulched with black plastic. Lay out a layer of black plastic over your row then cut holes in the plastic and plant your transplants. The plastic will warm the ground quickly, help retain moisture and help control weeds. Preparation and Care: Watermelons do best in fertile well drained soil. Add a basic starter application of 10-20-10 fertilizer to the soil during preparation prior to planting. Watermelons do not like it when they are too wet or too dry. The best quality of melons are produced when the vines are healthy, the temperatures are warm but not extremely hot and the weather is on the dry side at harvest. Watermelon vines can be trained to grow in rows. Gently move the vines to grow in the desired direction. Fertilize: Fertilize once when preparing the soil. You can also add a second optional side-dress fertilize application of 10-20-10 fertilizer when the plants begin to vine. Late varieties may need an additional side-dressing when the vines set fruit. Harvesting: Depending on the variety of watermelon, it may take you a few tries to become familiar with the best stage for harvesting. 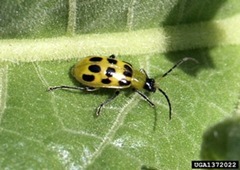 One indicator is to look for yellowing on the underside of the watermelon where it sat on the ground. Thumping the watermelon is a time honored tradition of testing for ripeness. Listen for duller sound of a ripe melon as opposed to a metallic sound. This technique will require some practice. 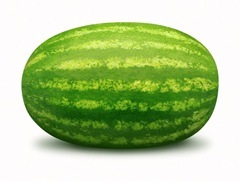 As watermelons age, they swell then split when over-ripe. You can look for the swelling as another indication of ripeness. Pick watermelons early in the day on every other day early in the season and every day during peak season. Be careful not to damage the vines when picking.